The Asheville Design Center called for converting a tangle of highways and ramps into an extension of Asheville's urban street grid. North Carolina DOT wants to rush forward without committing to this plan. 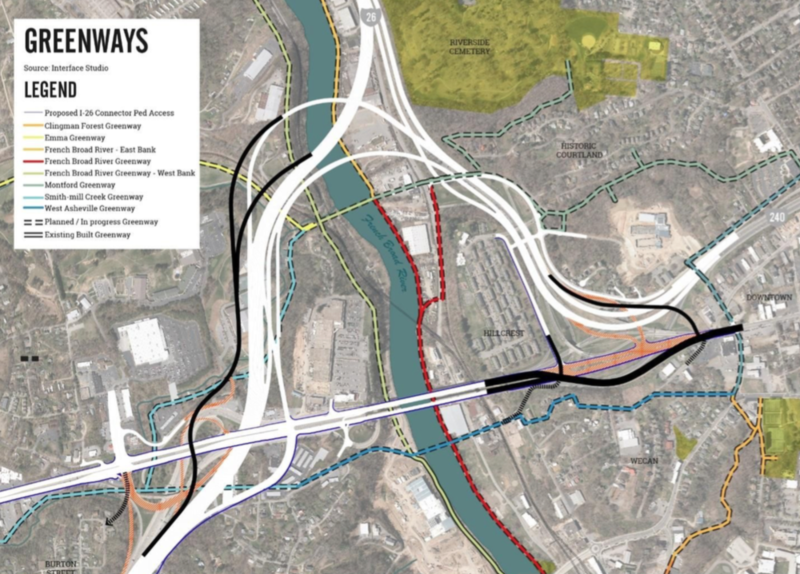 Back in 2016, a coalition called the Asheville Design Center prevailed upon state and local officials to adopt a more city-friendly approach to rebuilding the highway tangle where I-26 and I-240 converge. Instead of expanding the footprint of huge roads and highway ramps, pumping more traffic and pollution through the heart of the city, the Asheville Design Center’s plan called for re-routing the road on the east side of the French Broad River, opening up more than 10 acres for development with a more fine-grained street grid, and converting a section of highway into a walkable, bikeable boulevard [PDF]. In the map below, the thick black route to the east of the river shows where the highway and its ramps would be realigned. Instead of the current highway design, this section would extend Patton Avenue as a surface street west of downtown. In addition, the Asheville Design Center’s plan calls for the Bowen Bridge — where the same road crosses the river — to be redesigned as a “gateway” to downtown, where people can walk and bike across the French Broad safely. The ramps in black on the west side of the river would divert car traffic away from this bridge. Essentially, it’s a recipe to expand the areas of functional city in Asheville and shrink the lifeless highway zone. And now civic leaders in Asheville are worried that the 2016 agreement is in danger of being jettisoned by NC DOT. NC DOT is trying to fast-track the environmental review process and accelerate the construction timetable by seven years. City Council members Julie Mayfield and Gwen Wisler warned this week that allowing NC DOT to rush construction before the review process has been finalized will rob the city of leverage to see its vision through. After the City Council gave its support to the project in 2016 under specific conditions, council members now worry that NC DOT will pull a bait-and-switch. “Thousands of decisions” remain, reports Mark Barrett in the Citizen-Times, from the reconfiguration of interchanges to the placement of sidewalks. Take the reconstruction of the Bowen Bridge and Patton Avenue, which the City Council wants to see remade as a local street, not a highway. NC DOT is currently planning for four westbound car lanes on the bridge — not very conducive for a walk or a bike ride — and has yet to determine if the eastbound side will have two or three lanes. 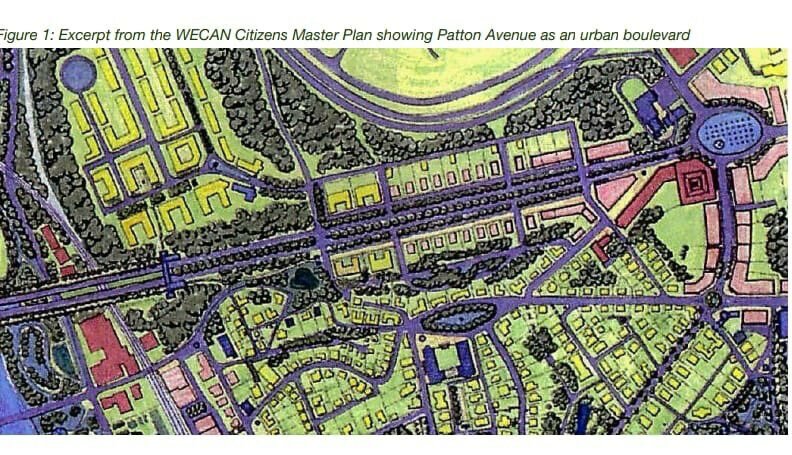 Above: The plan for Patton Avenue supported by the city of Asheville. Today, the French Broad River Metropolitan Planning Organization will vote on the state’s proposal to move the I-240 overhaul to the top of its approved project list. Asheville Design Center’s alternative would cost significantly less, make the street network safer and actually create tax revenue with infill development. It seems state DOTs are habitually acting against best engineering & planning practices.